When Christine arrived to pick-up the turkey, one of the animal control officers asked her, "Are you going to be slaughtering him for Thanksgiving dinner?" Everyone in the office laughed. This deep disconnect is unfortunately common...it is the driving force behind our Food for Thought campaign, which asks animal shelters to adopt an animal friendly menu policy for their fundraising events. It's hard to imagine a worse holiday for turkeys than Thanksgiving. Between 43-45 million are killed each year for the "holiday" alone. Wyatt won't be one of those turkeys. Abandoned at a southern California animal control agency a week before Thanksgiving, Wyatt faced certain death if not for Animal Place. Christine Morrissey of Harvest Home Animal Sanctuary reached out to us about what appeared to be an injured bronze-breasted turkey. The photo broke our hearts - it appeared the turkey could barely walk. He was splayed out on a slippery floor with what looked like severely infected feet. He was panting heavily, an indication of stress. We immediately said yes - we know how dangerous it is for a turkey to end up at a hi-kill animal control agency a week before Thanksgiving! Wyatt is a sweet, gentle turkey. While he is likely older than a year, he still peeps and cheeps like a baby turkey. It is heartbreaking to think his life would have been stolen from him for a moment of gustatory pleasure. Over the coming months, Wyatt will go through the "recovery" process. He has most likely been free-fed, leaving him overweight. 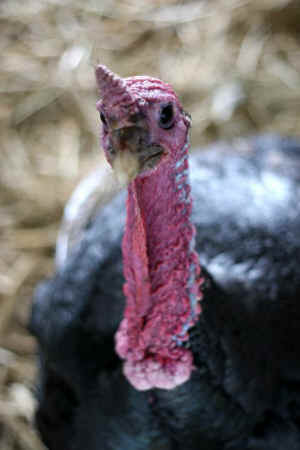 Obesity in turkeys bred for meat production is a grave concern. At Animal Place, Wyatt will be on a special diet that helps him feel full while also helping him lose weight. He has his own exercise regimen - he loves trotting after anyone who walks outside his enclosure! When he loses some weight and it is safer to physically restrain him, we will tackle his feet, which are grossly enlarged. If you would like to help Wyatt recover, please donate to our Rescue Medical Fund. With your help, $40,000 will be raised so that we can continue rescuing and treating animals like Wyatt. One more request! 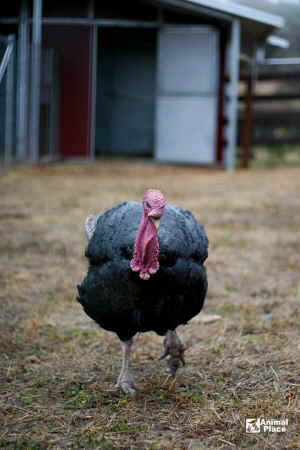 Want to help the turkeys like Wyatt who don't get rescued? Adopt a vegan lifestyle! It is the kindest, most just act one can take...and it's so empowering! There are a lot of wrongs in this world that cannot be easily fixed, but the one right we can make is how we spend our food dollars.